Lincelles was one of many ships owned by Duncan Dunbar II. 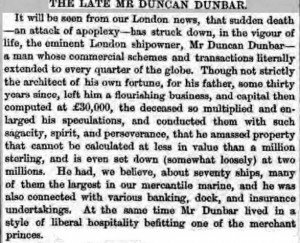 The ‘first’ Duncan Dunbar was a brewer and wine merchant. His son, Duncan II, owned the biggest sailing fleet in the world in the mid-19th century – mostly built in his own shipyard in Moulmein, Burma. Dunbar was a great believer in India-built ships and the vessels built in his yard were of teak cut from the forests that lined the banks of the river surrounding the yard. 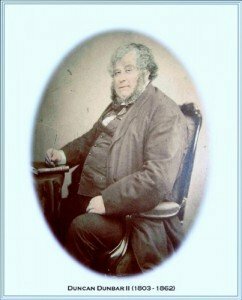 His fleet was mainly utilised as convict and immigrant transports and troopships in the Crimean War. As well as administering his great fleet, Dunbar founded the London Chartered Bank of Australia in 1852; he was on the committee of Lloyd’s Registry for 16 years and deputy-chairman for five. 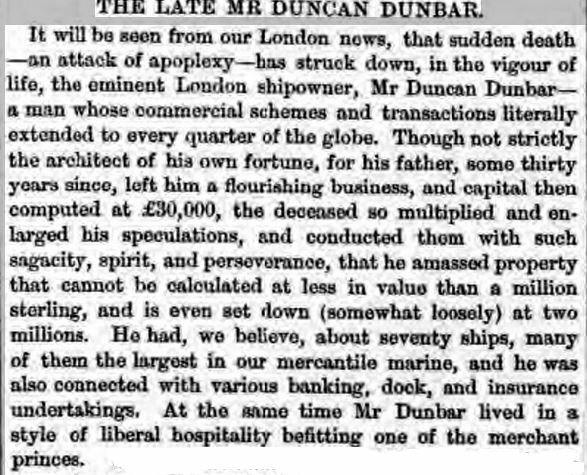 In fact Dunbar was chairman of many influential boards relating to the marine industry. Lincelles was a 904 ton ship that left Deptford after its fitting on September 9, 1861. She stopped off at Sheerness on 13th September where the first convicts embarked. 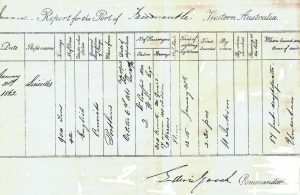 The next stop was Portsmouth where more convicts embarked, and finally Portland. 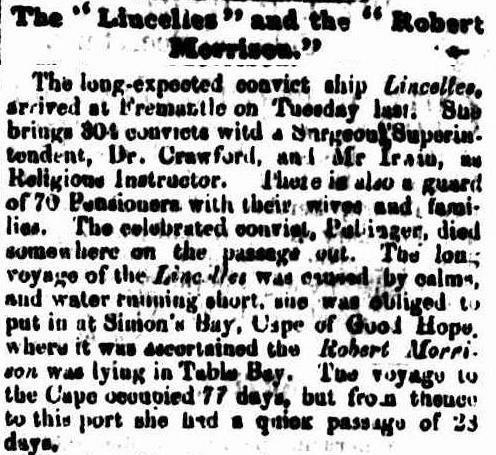 Lincelles took on the last of her human cargo on 23rd September but lay-to until 5th October when she finally sailed bound for the Swan River Colony and the port of Fremantle, stopping at the Cape of Good Hope on the way. She carried the 24th of 37 shipments of male convicts destined for Western Australia. 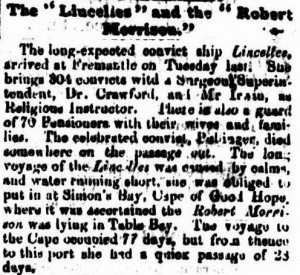 The voyage took 115 days and the Lincelles arrived in Fremantle on 28th January 1862 with 80 passengers and 304 convicts. Edwin Gooch and William Crawford MD, RN were the captain and surgeon respectively. Rev. William Irwin travelled as the ship’s religious instructor. This voyage on the Lincelles was to be the first for both Crawford and Irwin. Crawford would make another four voyages on convict ships to Western Australia and another to Gibraltar. Irwin also made many other voyages on convict ships. 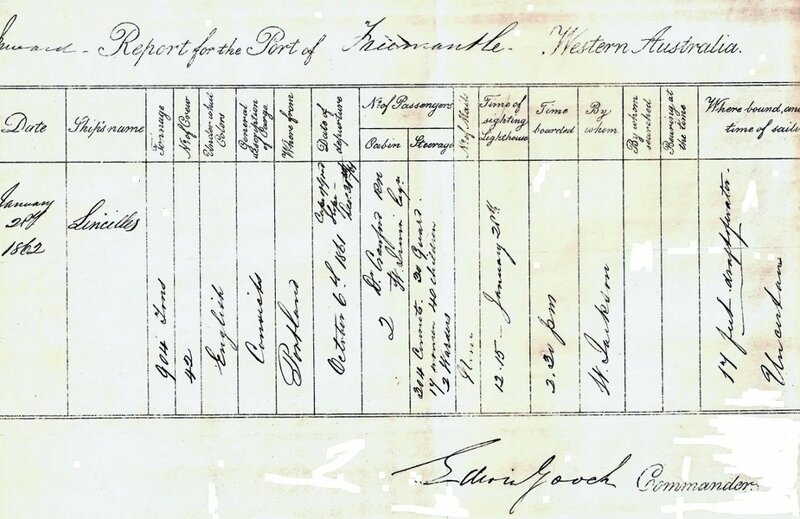 Assistant Warder at Portland prison, Alexander Armstrong, a Crimean War veteran, embarked at Portland to take up an appointment at Fremantle prison, as did Assistant Warder James Persee. while the newspaper account of Lincelles’ arrival states 70 guards and their wives and children! The authorities were far from slap-dash in their watchfulness of every detail of the voyage and we are fortunate to have a legacy of details from most of the journeys by way of surgeon superintendents’journals. On this voyage he recorded that 94 convicts had been on the sick list, two of whom died on the journey and two were admitted to the Colonial Hospital upon arrival. Ten convict guards had reported sick, but all had recovered. William Crawford’s surgeon’s journal for the voyage is preserved in the National Archives in Kew. Researchers can view a copy on the Australian Joint Copying Project (AJCP) microfilm reel 3181 which is held in most major libraries and archives throughout Australia. It can also be accessed by subscription on the ancestry.co.uk website. Lloyds of London Registers 1854-1881. Surgeon Superintendents’ Journals of Convict Ships, National Archives Kew. Perth Dead Persons Society (DPS) Website. British Newspaper Archive from Findmypast.com.